Resource productivity in Slovenia is strongly affected by the construction sector. Consumption of non-metallic mineral resources has a great impact primarily due to the weight of these products. It was the lowest in 2007, after which it began to grow due to a decline in construction activity. In 2014, it reached 1.34 EUR/kg. However, it is still below the EU average (1.98 EUR/kg). Resource productivity is an indicator expressing the ratio between gross domestic product (GDP) and domestic material consumption (DMC) in relation to weight. It is one of the most important indicators measuring the efficiency of resource use. · to improve the functioning of the economy while reducing pressures on the environment. The European Commission communicated their goal to improve the functioning of the economy while reducing pressures on the environment to the European Parliament, Council and the Committees via the “Roadmap to a resource efficient Europe.” The indicator “Resource efficiency,” which is the leading indicator, was selected for the monitoring of this goal in the field of efficient use of resources. The indicator has a few drawbacks, as it only describes resource efficiency from the perspective of the use of material resources. 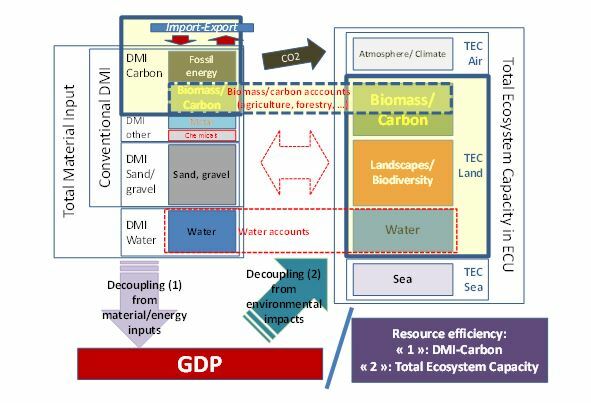 Therefore, the European Commission plans to supplement it with certain other indicators (macro indicators for the areas of water, land use and greenhouse gases). 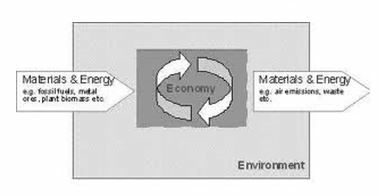 For its functioning, the economy requires various materials and energy from natural resources (fossil fuels, metals, biomass, etc. ), while on the other hand, we put pressure on the environment with emissions and waste (figure OD6-3). 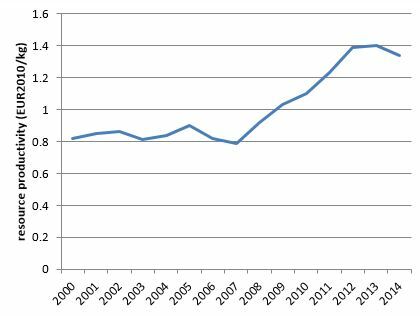 Up until 2007, resource efficiency in Slovenia was around 0.8 EUR/kg. After 2007 it began to grow, amounting to 1.4 EUR/kg in 2013. In 2014 it slightly dropped again, to 1.34 EUR/kg. The improved resource efficiency after 2007 was largely a result of the reduced use of building materials. According to the data provided by the Geological Survey of Slovenia, production of raw materials for the construction sector (technical stone, gravel and sand) in 2014 (10,922,593 tonnes) amounted to only half of the production in 2008 (19,488,636 tonnes), while the production of other non-metallic mineral resources (such as raw materials for the manufacturing and building materials industries) remained more or less unchanged. The use of non-metallic mineral resources strongly affects resource efficiency, largely due to the weight of these products. Therefore, resource efficiency reached its lowest level in the period 2006–2007, when construction activities were very intensive due to the finalisation of the motorway system, among other things. The growth of resource productivity doesn’t necessarily mean that the actual use of resources was reduced. It can mean that the economic growth rate in a given period exceeds the use of resources. In 2014, average resource productivity in the EU was 1.98 EUR/kg, while in Slovenia it was 1.34 EUR/kg.